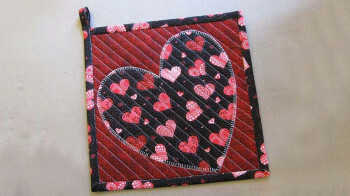 Sewing sister-in-laws, Liz and Elizabeth Evans, love sharing quilting with others on their blog. 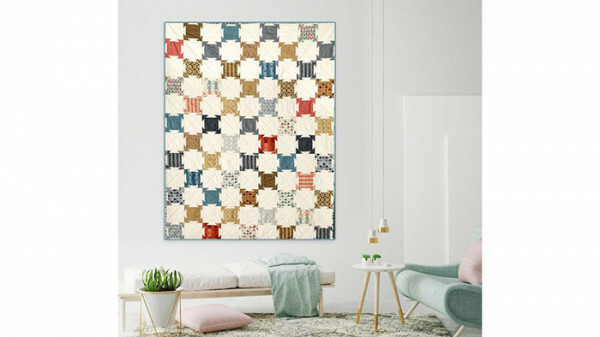 Not only is the Building Blocks Quilt is to easy create, but it measures 64" by 64" making it the perfect quilt to cuddle with your loved ones around an open fire or during movie night. Read more about the inspiration behind this quilt and find the project instructions and free PDF download here. For the Baby Lock Sewlebrity Love of Sewing Challenge, Pat Sloan shared how to make a free Jelly Roll Quilt Pattern. 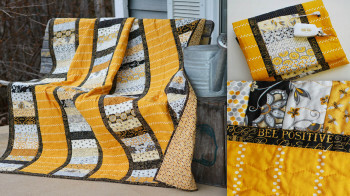 The Gold Coins Lap Quilt was created with 1 Jelly roll and fabric sashing. Measuring at 50" x 62" this quilt is a great project to use up any extra jelly roll strips you have in your sewing room. 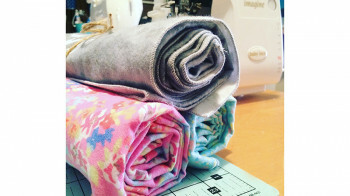 Head over to Pat Sloan's blog to get started on this fun quilting project here. Amy Smart from Diary of a Quilter shares a retro spin on a quilting classic, the pinwheel. With fun fabric choices and your quilting machine, you can easily recreate this unique project. Follow along with Amy as she shows you how make own of your own step by step. She also includes a link to a binding tutorial. Check out this unique quilting tutorial here. Bring a classic children's story to life with this charming storybook quilt. Follow along with the instructions to piece together a happy ending. This is a perfect weekend project you can enjoy time and time again. Find the project instructions and supply list here. Patty Young and Emalee Grambo of MODKID, LLC are sharing how to create a beautiful quilt made from fabric strips instead of quilt blocks. This unconventional quilt is easy to create and is a great project to make with friends. Measuring at 46" x 46", this quilt makes for an eye catching display of someone's love of quilting and creativity. See how to create one here. Owner of KelbySews, Kelly Bowser was featured in Missouri Star Quilt Co's Tutorial Reboot with her Simple Hexagon Quilt. Kelly says this is a perfect quilt for an experienced beginner. She recommends watching Jenny Doan's quilt tutorials as a quick reference to how you can easily recreate her quilt. Check out how to create this beautiful quilt here. Be sure to bookmark these tutorials so you can add them to your quilting to-do list. Check back soon for our National Quilting Month wrap up!